Spain was an important step in my love for food. They may not be world-renowned for their cuisine, but Andalucía is the birthplace of tapas and there are a LOT of good ones to be found. Tapas began as a free snack that a bar would provide when you ordered a drink. When they served you, a small plate topped (tapear) your glass to keep the bugs away. Order another drink, get another tapa. Granada is about the only place that will still provide free tapas with drinks (albeit their prices are higher than others…), but nearly every bar has at least some offering of tapas in their establishment. 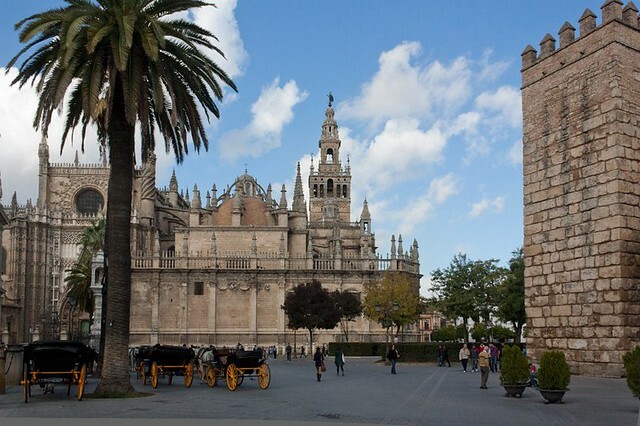 One other fun fact: Seville has the highest number of bars per capita in Spain! Maybe the world. But take it with a grain of salt, because a sevillano told me that, and they love to boast about their city. I halved the recipe above. The only adjustment is to use a medium pot instead of a large pot, and check the chicken about 5 minutes earlier. Heat 3 Tbsp olive oil in a large pot over medium heat. Add almonds and stir until golden brown (watch them!! ); transfer to paper towels. 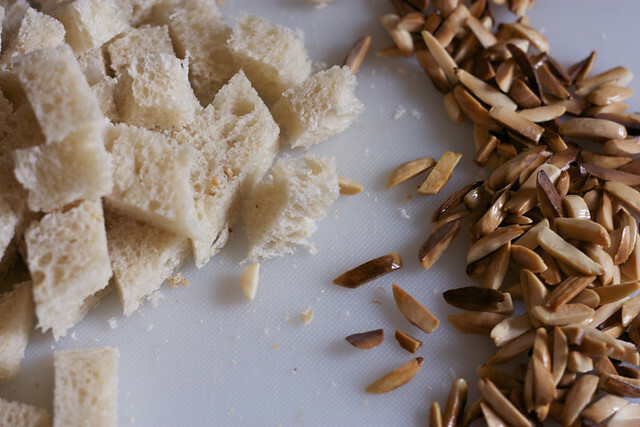 Place 1/3 cup almonds in a blender or food processor; save the rest for garnish. Add bread cubes and garlic to the same pot. Cook, stirring frequently, until the bread is golden brown. Place in the blender or food processor, along with chicken broth, white wine, saffron (optional), salt and pepper. Blend until mostly smooth. Heat 1 Tbsp olive oil in the same pot over medium-high heat. Season chicken with salt and pepper. Place the chicken in the pot, cooking until golden brown on all sides, about 10 minutes. The chicken does not need to be cooked through. Reduce to medium heat and add minced onion to the pot. Cook until caramelized around the edges, about 6 minutes. Add sauce and chicken to the pot, making sure to spoon sauce over the chicken to cover it. Bring the sauce to a simmer, cover, and reduce heat to low. 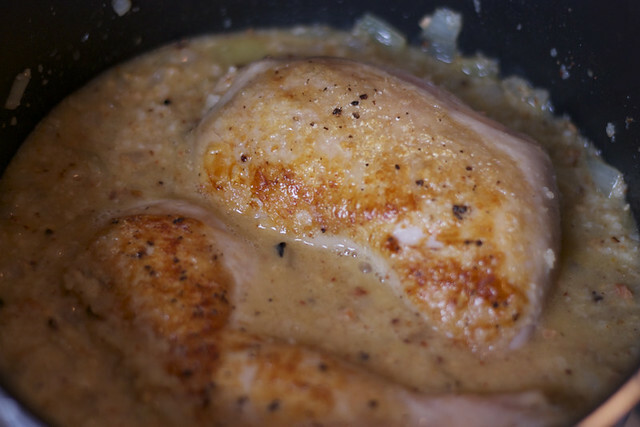 Simmer until the chicken is cooked through, about 20 minutes (check at 15 if halving the recipe). 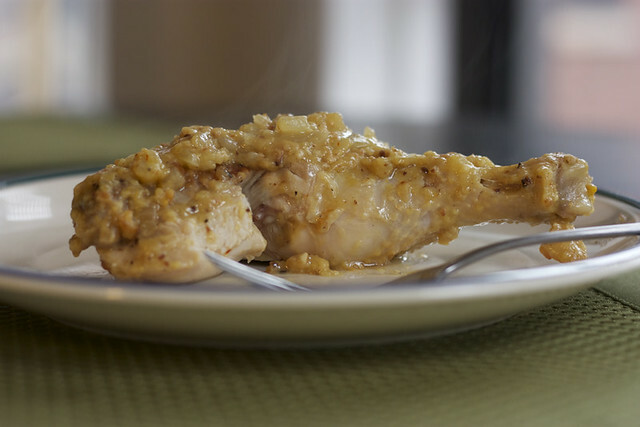 Serve the chicken with remaining almonds and chopped parsley. Wow… Elizabeth, quite the ‘little chef’ …. How did you determine the recipe ? Thank you so much. I used to live in Sevilla and have been craving pollo con almendras and solomillo al whiskey for two years. Thanks for the recipe, can’t wait to try it out.